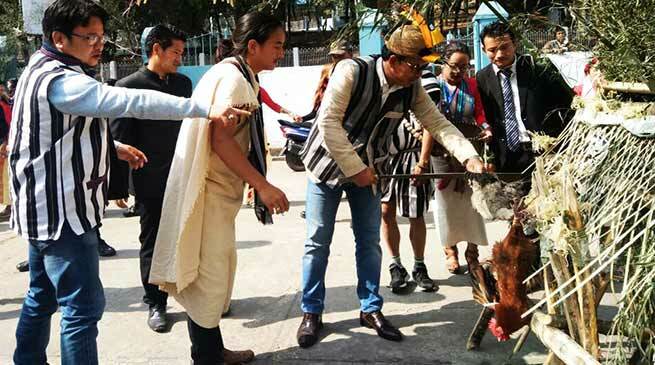 Parliamentary Secretary RD & Panchayat of Arunachal Pradesh, Mama Natung today inaugurated the 11th Pre-Nyokum Yullo festival celebration at Shillong. The celebration was organised by Pre-Nyokum Celebration Committee, Shillong of Arunachal Shillong Students Union at Savio Hall at Laitumukhra. Addressing the Arunachalee students studying in Meghalaya Natung lauded the students community maintaining the diversity of different community and celebrating the festival is the sign of oneness. He said that celebration of our traditional festival which have deep rooted culture with traditional value of our community which shows our identity and those who do not maintain such culture and tradition will lose their identity in time to come and can say he/she may loosing their mother. He appeal the students to puree their academic activities so that they become a fine gentleman to serve the society. Guest of Honour All Nyishi Students Union Vice President Tana Susil Tara while appreciating the organising community and said that it is our endeavour to carry forward the legacy of our seniors to follow footprint in maintaining the age old cultural heritage and tribal identity of different community of state by celebrating such festival even if they are anywhere in country. Susil said that wherever we are we need to be united and work for the welfare of our state, region and country with oneness, strength and unity. He said that we need for the community development of our tribal people of state through a unified approach without thinking communally for Nyishi, Adi, Galo, Tagin, Monpa, Aka, Miji and others. Chief Patron, North Eastern Indira Gandhi Regional Institute of Health and Medical Sciences (NEIGRIHMS) Shillong Associate Professor Dr. Tani Natung in his address lauded the presence of dignitaries which boost the morale of the Arunachalee pursuing studies and serving in Meghalaya in general and Shillong in particular. He said that this is the 11h celebration and would continue to do so even in future which signify unity of the locals students of state. Parliamentary Secretary PHE & Water Supply Kumsi Sidisow, Arunachal Pradesh state BJP General Secretary Jarpum Gamlin, Deputy Resident Commissioner Marge Sora, ANSU Education Secretary Ame Natung, Co-convenor Takam Mangha, Office Secretary Lokam Achung among more than 400 Arunachalee students pursuing their studies took part in day long celebration. The day long function which include cultural extravaganza of different community of state and other melodies performed by the students and community feast.